This compilation of beginner’s modules clocks in at 51 pages, 1 page front cover,1 page editorial, 1 page ToC, 1 page back cover, leaving us with 47 pages of content, so let’s take a look! So, we begin with a brief introduction that sets the stage – this pdf offers 4 brief, introductory one-on-one gaming scenarios/encounters for each of the 4 core classes – fighter, cleric, magic-user and thief. Then, we get a fully depicted starting tavern and an introductory module intended for a group of adventurers. The rules default employed within would be Swords & Wizardry Complete, and we get, where applicable, solid maps for the encounters/areas. There are no player-friendly versions of the maps provided, alas. It should be noted that these are brief enough to be spliced into the start of gaming for a party, allowing each PC a defining moment to kick off the adventuring career. Alternatively, they can be run as a series of brief vignettes to explain the PC’s training. The pdf also includes 4 nice new monsters, which are rather nice, and two sport solid artworks. They also have component use – i.e. taking remains can have tangible effects, which is something I like to see. One of these does note that the liquefied brain of the critter makes writing scrolls easier, but fails to specify precise effects. The pdf also offers 3 magic items, and these are solid, with particularly the torch knives being an interesting item, in spite of the simple concept. However, formatting in the pdf of such items deviates from established standards. Read-aloud text is printed in italics, setting it apart from the rest of the text. Now, as far as the introductory mini-modules are concerned, these could also work as roadside encounters most of the time, and they note a general setting/environment. They are generally very easy to integrate into the game. Now, there is one addition to the game here, the so-called Skill Challenge. Before you boo and hiss – it’s not PFRPG’s take, but the rules are simple: Character level + attribute bonus + d20. If you beat the DC, you made the check. These are not essential and may be ignored, if you so choose. Now, these being adventures, the following contains SPOILERS. Potential players should jump ahead to the conclusion. All right, only GMs around? Great, so let’s start off with the cleric scenarios! The first one has the cleric save a young boy who is about to be roasted by 2 goblins; noticing footprints, the creatures can be stopped in time. In the village of Aquin, two skeletons roam in a crop field – smart PCs will find unmarked, shallow graves and sanctify them, preventing further rising skeletons. Now, the third of these vignettes deserves special mention: Test of Faith has the PC in front of an archway of swirling energy – there are 4 different tasks, all of which are assigned to different spells. This teaches the clever use of spellcasting to solve issues. Love it. The final one has the PC deliver a healing potion to a friend of their mentor – en route, they can fight skrivs (one of the new creatures) and retrieve the woodsman’s axe. This one teaches the importance of thinking and items – its reward includes a bracelet with minor AC-boosting properties. The first fighter scenario has the PC fight 3 encounters in a fully mapped arena; the second one takes the classic trope of the boar hunt and may result in a friendly rivalry. Encounter number 3 is pretty tough – a caravan has been attacked, and while the PC gets a Strength-boosting potion, while 6 orcs + chief make for deadly foes. Only two orcs will attack first; after that, the chief will challenge the fighter to single combat. Defeating the chief will scatter the orcs, which is yet another valuable lesson: Take down the leader and the foes may scram. The final encounter is a classic tavern brawl that preferably should not result in deaths – as such, the player is taught that killing is not always a smart chance. Magic-Users begin with a test – their instructor has been missing for a while, and the potions they have been working on may spoil. Clever observation may note a hidden trapdoor, where giant rats loom and a pseudo-corpse lies. This one, in short, teaches problem-solving sans resorting to spells. The second encounter begins with a little map, and may have the PC ally with a balan versus a nasty necromancer and his skeletons. Thing is: The necromancer does not wish to harm the sacred bush, and has no intention of harming a fellow magic-user…allegiances can be muddy indeed. The third encounter has the PCs hunt for the aforementioned squishy squab birds, whose brain liquid can help write scrolls. The final encounter teaches magic item interaction and focuses on dealing with two pet stirges that have escaped. It should be noted that the presence of NPC allies in these help to somewhat counteract the squishiness of magic-users. The thief-scenarios begin with the PC earning their lockpicks by stealing a purse; scenario number two features a training burglary: The PC has to enter a guarded building and steal the contents of a box – and yes, it has a secret compartment. The third scenario nets the PC a torch knife as the thief enters a barrow (a 3-room mini-dungeon) recently cleared by adventurers. Nice one! The final test has the PC observe a cabin – and the mentor wants something from inside. What? Up to the PC to find out! We don’t get a map for the cabin, but interestingly, the most valuable item (in GP-value) is NOT what the mentor wants – this one teaches that value, though codified, can be subjective! After these, we get a very well-written and detailed tavern: Beyond the staff, the rooms are described in exquisite detail, with different rates and some cool hooks included. The place is fully mapped (though I wished we got a player-friendly version) and its cellar also holds a secret – a well-made, fun tavern that once more showcases Tim Shorts’ talent of writing plausible NPCs that feel alive. The final section of this book is devoted to the “Betrayal at Bender’s End” introductory scenario; a well-rounded party is recommended, and while the adventure notes that the PCs should have backup characters, this is no funnel or save-or-die-athon. That being said, it’s a dungeon, and PCs may well die. The cleric’s mentor notes that one of his acolytes has been kidnapped. The trip to the eponymous “Bender’s End”-complex can be spiced up with a 20-entry long, detailed table of random encounters. The fact that a dungeon requires some respect is driven home from the get-go: The PCs find the corpse of an unfortunate thief, and it’s infested with rot grubs…so yeah, this can end deadly. The PCs will witness the efforts of a tougher adventuring party here as they explore the complex, but also their…well, less than successful members. Beyond goblins, the PCs will find the missing acolyte as well as a nasty deserter. Each class will have something to do, and the complex does a good job at environmental, indirect storytelling. Similarly, it rewards smarts and can be considered to be a good example of a rewarding introductory scenario. It’s tough, but fair and manages to evoke a concise atmosphere. In short: A good example of what such a module should do! Kudos! Editing and formatting are good – while not every rules-relevant aspect here is perfect, and while I noticed a few typos, nothing serious. Layout adheres to a two-column b/w-standard with no frills, and the pdf sports quite a few nice and sometimes slightly humorous original artworks by Jason Sholtis and John Larrey. The maps are detailed and deserve special mention – they are functional and neat, but I wished we got player-friendly versions. Unfortunate would be the lack of bookmarks, which constitutes a significant comfort-detriment. I can’t comment on the print version’s merits or lack thereof, since I don’t own it. 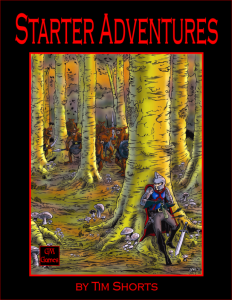 Tim Shorts’ Starter Adventures book surprised me in a positive manner, mainly because it strays from the clichés while still providing the essential beginner’s experience. If I have to read one more 1st level module where the PCs kill goblins, hobgoblins, an orc and then an ogre boss or a shadow boss, which is invariably defeated by manipulating a magical light source, I may barf. This collection does feature goblins, orcs, etc., yes – it features the classic components. But at the same time, their execution and presentation makes these feel fresh, not like a stale rehash. The details provided for the tavern also are impressive, and the vignettes allow for the contextualization of the PCs and start them off with adventure hooks and some NPCs; they are not tabula rasa anymore. This helps with the task of making the group gel together and evoke a sense of consistency. While the lack of player-maps is somewhat saddening, it is only the lack of bookmarks that makes me round down from my final verdict of 4.5 stars. If you’re looking for well-crafted introductory adventures for players, this delivers in spades and is well worth checking out! You can get this neat collection of introductory options here on OBS! You can get the PoD-print version here on lulu!